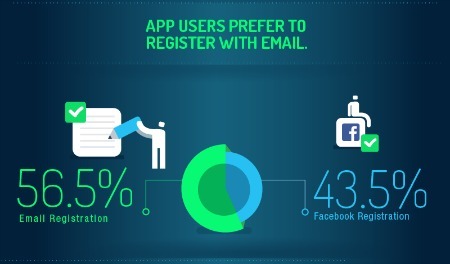 Do Consumers Really Prefer Social Login? Social login has become a popular method for website designer to leverage on their websites in order to increase registration among users - begging the question does consumers desire for social login transfer to mobile apps? Appsee, a mobile analytics platform, has announced the findings from its first every Mobile User Behavior survey. The survey focused on three specific registration metrics: login preference, total registration time and number of registration fields. One of the most interesting findings from the study is that a majority of those surveyed (56.5 percent) stated that they prefer to manually register for an app by creating a unique account via an email address while just 43.5 percent stated they prefer to login with Facebook. Moreover, the study found that the average time a user spends on the registration page is 36 seconds allowing them time to only fill out a few text fields. Additionally, the study found that the average number of text fields with an apps email registration page is 3.8 with only 35 percent of apps having more than four text fields.